This is the most fun I’ve had setting up a website. 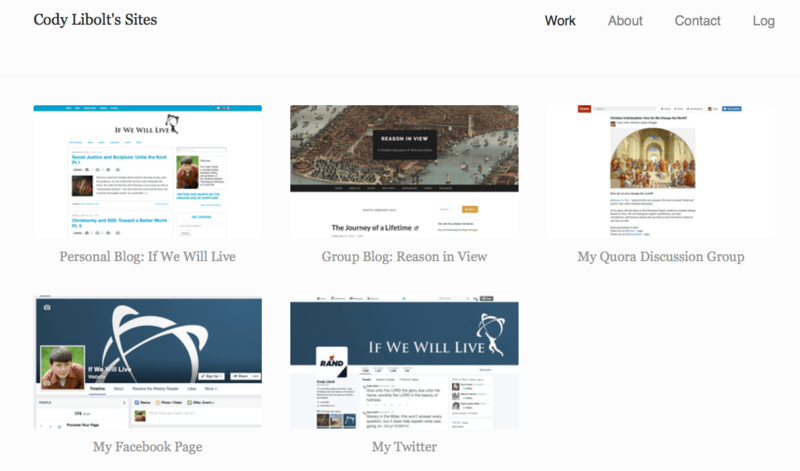 It’s a portfolio of my online bases and outposts (blogs and social media sites). Making this was as easy as loading some screenshots and filling in the blanks. Click here to check out my portfolio. The site that let me do this is called Carbonmade. I’m not affiliated with them, but I’m really excited about their product, so let me tell you about it. Carbonmade is free. It’s just for portfolios. As opposed to a blog site, Carbonmade does a lot less, but it does it to perfection. In 10 minutes you can have your own portfolio running, displaying collections of photos or PDFs. In the future I might use Carbonmade for displaying information products that I make. For now it’s a cool way to introduce people to what I do online. Several templates to choose from. A ruthlessly narrow set of features, making it ridiculously easy (I mean as easy as turning on an Xbox). To see examples of people using Carbonmade to the full, check this out. To set up your own, here’s where to go.